It expresses the planets of the solar system. The flat rocks facing each other are Sagittarius and the earth, I was told through the channeling. I was told they are talking with each other that the earth should become flat=equal like Sagittarius. 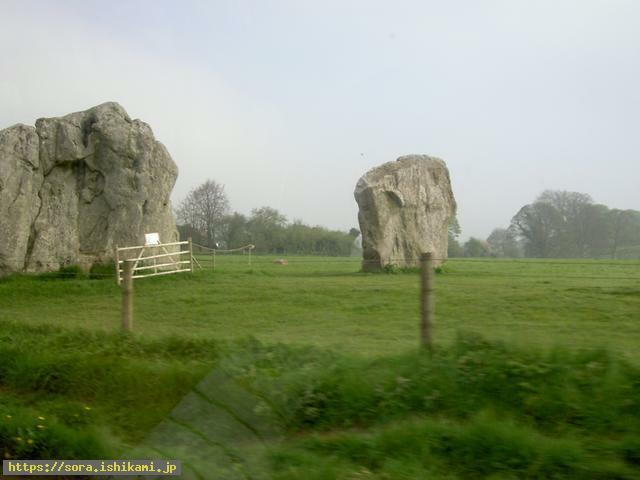 "The stone circle of Avebury"
According to the commentary about the stone circle of Avebury, the big megaliths of the stone circle of Avebury to which I drop in on the way to Stonehenge was being left there but the small ones had been removed. The traces of the removed stones were shown by the concrete. I was told planets of the solar system were shown by those stones. One small rock showed the wreckage of Lucifer which exploded and was decomposed, I was told through the channeling. The flat rocks facing each other are Sagittarius and the earth and they are talking that the earth should become equal as humans of the earth are not equal. The guide explained the flow of energy with the bented wire(dowsing) and the wire moved horizontally to the side when he drew near a stone. However the wire showed × when my traveling companion tried it. I was told the × made by the wire showed that the explanation of guide until then was wrong. ＊　As all the beings in Sagittarius were equal, the shape of Sagittarius was flat, I was told.